Successfully Added Football Doll Bluetooth Speaker - Bluetooth 2.1, Aux In, Micro SD Card, FM Radio, Hands free (Black) to your Shopping Cart. 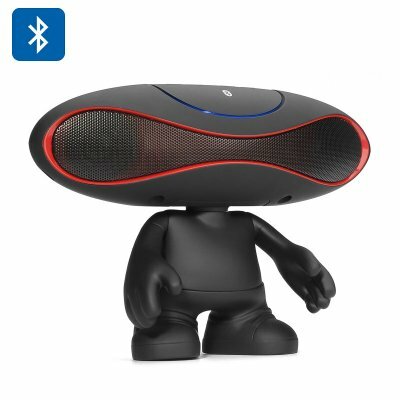 With a trendy design this Bluetooth speaker is like a weird alien with a football shaped head. Its sure to get everyone’s attention and for all the right reasons as it pumps out a massive sound from its twin 3 Watt speakers. With Bluetooth 2.1 connectivity and enhanced data rate you can wirelessly stream music from your phone, tablet PC or laptop. There is a micro SD card slot letting you load up to 32GB of music directly to the speaker as well as an Aux in port for your non Bluetooth music players. Alternatively you could tune this speaker into the FM radio stations and for the latest sports commentary or get a rundown of the 10 ten from your favorite stations. With its aesthetic appeal and colorful LED lights the speaker will be the focal point of any room and adds an extra dimension to its musical prowess by lighting up as it plays your tunes. A built in 800mAh batter will bring 3 hours of play time and thanks to A2DP, HSP and ACRCP can also be used as a hands free way to answer your calls. The Football Doll Bluetooth Speaker comes with a 12 months warranty. Brought to you by the leader in electronic devices as well as wholesale Bluetooth speakers..